Perennial plants for the formal garden to the native meadow. The Farmer's Daughter presents the largest, most diverse selection of perennial plants in Rhode Island. We grow most of our perennials on-site, but we also obtain plants from only the highest quality growers in New England. We ofer new varieties as well as historical favorites. Whether you have a formal garden, shade garden, cut-flower border, garden by the sea, native meadow, etc., our experienced staff can help and guide you to purchase the perfect plants! Looking for flowering plants to color and energize your borders all summer long? The Farmer's Daughter provides you with an immense selection of flowering perennials that have a wide range of blossom forms, hues and prolonged blooming periods for all season interest. If it's daylilies that suit your fancy, be sure to view our selection of rare collectable Hemerocallis. If you have a woodland garden or a shady spot, be sure to visit our shade pergola which is overflowing with a spectacular selection of flowering and foliage plants for low light conditions. Let us inspire you to create your own living tapestry of colorful foliage. Whether you have dry shade or damp, we have a palette of plants that will grow for you. Mother Nature can't be wrong! Proven by the test of centuries, native plants will thrive in any landscape situation. At The Farmer's Daughter you will find native plants that are indigenous to the northeast and more specifically, Rhode Island. A native planting is economically and ecologically a positive choice! Native plants exhibit characteristics of drought and wetland tolerance, nourish local wildlife and are deer resistant. Help support local sustainability by planting natives! With our thriving deer population here in South County, we have the experience and knowledge to suggest plants that deer find least appetizing. These include plants with scented foliage, fuzzy leaves and thorny stems, as well as natives. Please keep in mind, if Bambi is hungry enough, he will devour any plant. To thrive by the ocean, plants must be tough enough to withstand salty winds and sandy soils. The attributes that these 'tough guys' have are spiny, thick succulent, silver and/or fuzzy foliage and deep root systems. These plants are also ideal for roadside conditions. If they can survive a mountain climate, they will thrive in your backyard! Diminutive yet hardy, these collectable gems are perfect for troughs, rock gardens and sunny niches. Our vast selection of alpine plants offers the diversity of flower color and form, foliage texture and habit necessary to design a small scale garden masterpiece! Plant your garden patios and pathways with a living carpet of ground covers! Whether you have sunny, shady or high foot traffic areas, there is a ground cover for your landscape situation.A great alternative to the high maintenance of a lawn, these ground hugging creepers will relieve the stress of weekly mowing and watering. Introduce natural sophistication to your landscape by planting ornamental grasses and sedges. 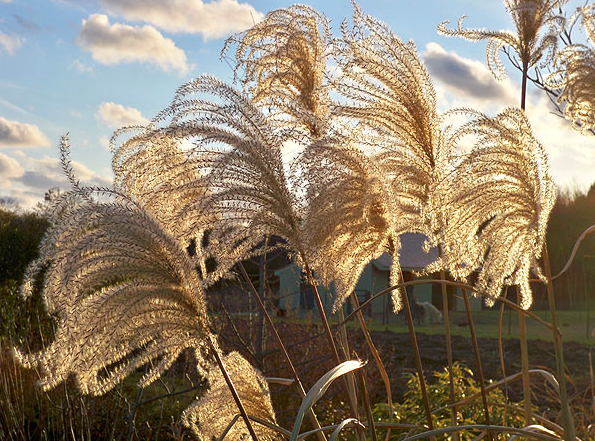 Much like a tree or shrub, ornamental grasses add architectural interest to the garden. Perfect for foundation plantings, they soften building corners with texture and movement and are an excellent focal point in the winter garden. Reminiscent of the seaside, ornamental grasses will make you feel like you are near the ocean with their graceful movement. Established grasses are drought tolerant, deer resistant and ideal for a sunny garden. Adding soft texture to the bold foliage of a shade garden, sedges and Japanese forest grasses come in a variety of sizes and colors guaranteed to illuminate a shady spot.